As fans, we all have our favorite artists. For me, I’m all about Goran Parlov, Wes Craig and Craig Thompson, all of whom stun me with each new work they release. But beyond that when I think of my favorite comics it’s in the context of the enduring visuals. Yorick’s straight jacket being taken up by the wind. Bone and those stupid, stupid rat creatures standing on a wispy branch. Herr Starr trying on hats. Moments both big and small dot my personal history of comics, and art is most often what is seared into my memory. It’s the nature of both comics and humans, really. We love stories, but it’s much easier and more natural to have the visual elements last with us rather than passages of text. One of the coolest things about comic books – especially compared to other storytelling mediums such as movies or TV or books – is we can own the original forms of our favorite moments. For certain comic fans, collecting the original art of those aforementioned parts of comic book history can be just as valuable to them as the comics themselves. They can be their comic holy grails. I’m a fan of original art myself. While I get commissions (or original art by an artist you pay them to create) more often than pages from my favorite books, I have a small collection of original pages. They’re two of my most precious comic belongings, and that isn’t just because I am on them (shout out to Joe Eisma and Rob Guillory for drawing me into comics!). It’s because they’re comics in pure form, and such a vital part of the creative process for a medium I adore. Being a fan of original art can be a tricky thing though. Sometimes it is difficult or even impossible to track down the right piece. Many fans don’t even know where to start. You can buy pages? How do I buy them? Where are they for sale? It can be a frustrating experience. And for many people, one that leads to giving up before ever getting started. That’s where comic art reps come in. These are the people who work with artists to sell their original art. For you, the fan, they ensure that it gets into your hands in a timely manner. They’re an invaluable resource to both sides, and their business is booming alongside comics themselves. In this week’s longform, we will delve into their business and how they work while exploring their value to all sides of the comic world. You’ve probably seen an art seller at a con before and not even known what they were. You’re walking around a con when you see either a mass of art hanging for sale at a booth or a collection of artists together under one banner. It’s a common occurrence, but those are art sellers of two different varieties. Lu himself is a rep, and those types of sellers will be what we are focusing on today. While dealers are a viable side of the original art world, they don’t represent anyone but themselves. Reps on the other hand are directly involved with artists, and they can make a huge difference in their lives. As we’ve covered in several articles on SKTCHD, many artists barely have time to fit in sleep and living an ordinary life, let alone selling their original art after they craft it. For artists, it can be secondary to the point they don’t even do it or when they do, they forget to send the work or never respond to the original emails from buyers. That’s problematic for all involved and is at the core of why art reps are needed in today’s industry. That isn’t why reps necessarily got into the industry themselves though. A big part of why they sell original art is because they’re fans themselves, and ones who loved original art. Jason Schachter of Essential Sequential – who represents artists like Fiona Staples, Amy Reeder and Andrew Robinson – started because he wanted to get more art himself. “When I was in college I couldn’t afford much so I had to buy and sell to be able to get some pieces that I wanted,” he said. His passion for it was triggered by a first experience getting a head sketch – “I was hooked” – and it expanded as he built his collection. Paolo Belfiore, who represents Ryan Stegman, Jenny Frison, Jeff Lemire and more at Cadence Comic Art, came from a similar background. While Lu also comes from a background as a fan and a collector of art, his experience was a little different than the other two reps I spoke to. It came from one instance of buying art and what spun out of that. From those successes, Lu looked to develop both his artist list and his business. Creating Felix Comic Art may have been spontaneous, but its expansion has been much more meticulously planned. Lu doesn’t believe in just getting anyone – “I’d rather keep it small and manageable,” he said about his artist roster – and any additions tend to either come from artists whose work he or Pitarra enjoys. In fact, Pitarra admits to pestering Lu to add artists he likes on the regular, which led to James Harren being added to the Felix Comic Art collective. Belfiore and Schachter both target artists whose work they enjoy, but the business side of things is much more top of mind for both of them. “I generally like to work with artists that I would buy from myself. However, this is also a business, and this is how I put food on the table so looking for (sellable) work is on my mind,” Schachter said, before adding he also ensures that they’re a good fit personality wise with the rest of his artists. Their stables of artists have grown recently, and a big reason is that the original art market is growing in parallel to comics themselves. As Schachter noted, “the popularity of the superhero films and conventions are pushing more people into purchasing original art,” and that has led to art going for “astounding prices” in auctions. That change has led to more reps entering the market, but that also means established ones like Belfiore, Lu and Schachter are even more attractive by comparison. Even beyond that, artists can sell their art themselves, if they can find a system that works for them while still allowing for time to create the art they’re aiming to sell. 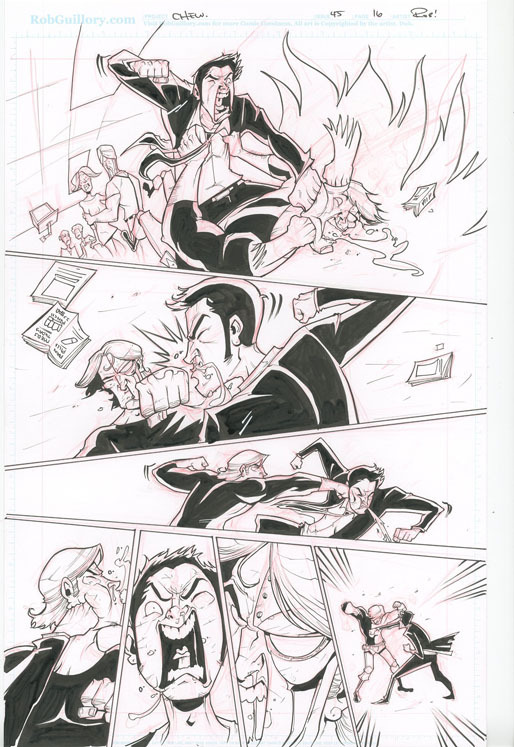 Rob Guillory, artist of the Eisner winning Chew at Image, has made it work for him. But he needed help, despite never expecting a need for it. Guillory’s opened an online store and has seen success with it. 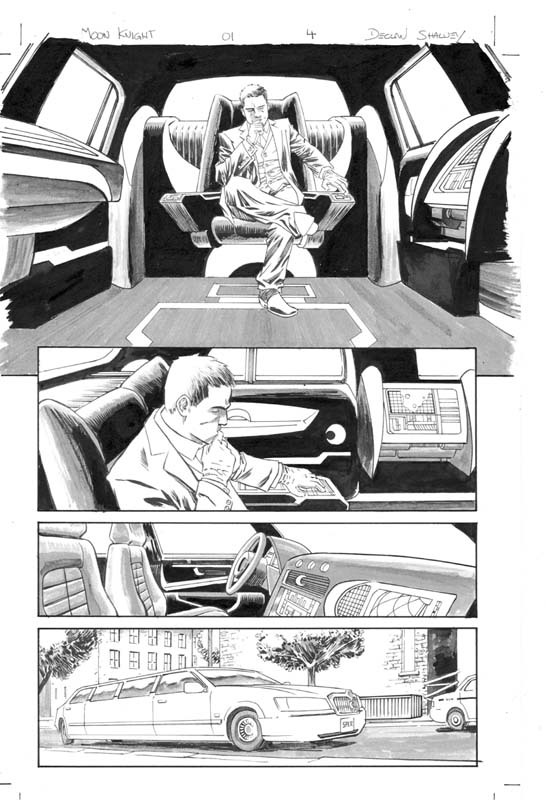 Original art sales were about a third of his comic revenue early on before settling around a fifth of it these days. But it has been a process. That’s where the issue lies for most artists. Guillory’s a systematic guy, both in how he creates the art and how he and his wife sell and ship it. 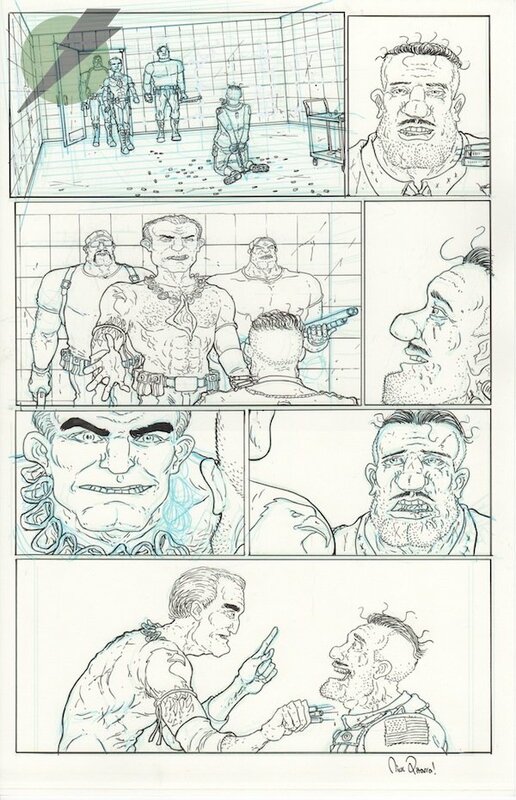 Not every artist is like that, and for a self-confessed disorganized type like Pitarra, the value of a rep goes far beyond the simple act of selling the art. Let’s take a deeper look at the more full-service offerings in the next section. I bet you’re thinking, “I already know what art reps do. They sell original art.” You’re not wrong. That’s the biggest part of what they do, and the number one reason artists end up working with them. But that’s only one aspect of a multi-faceted experience reps often give their clients. Pitarra shared one of his favorite elements of working with Lu, and after this past weekend, I imagine every creator would be envious of him. As mentioned before, Lu and Pitarra are both friends and people in business together. Not every relationship is like that, Lu shared. Another big advantage for all parties is how commissioned art is handled. You may have seen in the past artists posting on their websites or social media commission lists for upcoming cons. That’s one way to go with it, and for many, it has proven effective. For artists, managing commission lists for cons and beyond can be troublesome, leading to negative experiences for the artists and the collector purchasing the art. Reps like Schachter help clean that process up. That element is important for the collectors, but for the artists, reps handling those day-to-day interactions and keeping an eye on the timeframe they have to work with makes it easier for them to focus on what they’re best at: drawing. Pitarra said he almost never has a bad con because of how effective Lu is at keeping his commission list at the right level, and that’s huge for an artist. 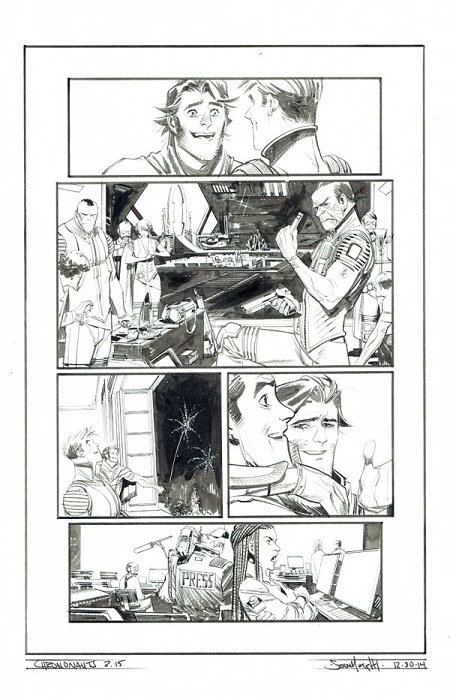 For someone like Declan Shalvey – the artist of Injection at Image – living in Ireland can be a hindrance in getting his art sold and making sure he has important items on hand for his con appearances in America. Working with Belfiore simplifies his life in that regard. “It means I have a hub; Paolo can sell art at shows I don’t make it to, I can leave my banner with him instead of carrying it across the Atlantic each time I go to New York Comic Con,” shared Shalvey. While that’s a small thing, it ensures that Shalvey’s bringing in money even when he’s not at a con and doesn’t incur unnecessary costs at American shows. It’s a plus. In a way, reps have similarities to agents in fields like sports and show business, save for the fact that they do not set up actual gigs for artists. They make artists lives easier so they can focus on the task at hand. If you get the right rep, there can be many perks beyond just the simple sale of art. Ultimately, selling the art is what it is all about, and that is something Belfiore and his brethren excel at. While original art sales used to be primarily completed at cons, these days, the Internet has made everything much smoother and expanded the audience, as Schachter noted when asked about the impact online sales have on his business. Lu for one cites the Internet as the main reason the original art market has exploded in recent years, and it’s easy to see why. For him, conventions aren’t even a major sales channel. They are more of an experience for him and his crew to meet the fans and have fun. They have so much fun there, the Felix Comic Art crew even makes videos to celebrate their experiences, like this one from Emerald City ComiCon 2015. Both Schachter and Belfiore agree that sales are a secondary element for most cons, citing that most of their artists just really enjoy the experience of meeting fans. That said, Belfiore mentioned that conventions help him build up awareness in his business, and that helps him boost sales elsewhere. For artists like Shalvey, Murphy and Pitarra, one of the most important things a rep can offer them is market awareness, helping them know what to price their art at and when the best time to sell is. “It’s also good to have someone who is aware of the Market; what’s selling, what’s a fair price, etc.,” Shalvey said. That’s something that Belfiore, Lu and Schachter all help with, and depending on the artist, it can be a collaborative effort in defining the price the pieces are set at. For others, they trust their reps to find the right level for their art, as it’s what they know and do. While Lu is an ace at those necessary things an artist needs to get their art out there – the mundane elements like scanning art, taking payments, packing and shipping art that are very important to the whole process – he prides himself on something not every rep does: building a market for his artists. “I’m definitely more proactive about finding buyers for the guys I rep and ideally, the right buyers with the right collections to place the art,” he said. Lu uses the Internet to marry art with collectors, using message boards, comic communities and more to find potential buyers of art from books like Pitarra’s The Manhattan Projects. Even beyond that, he’s made a concerted effort to reach casual fans who maybe are not aware of the world of original art. 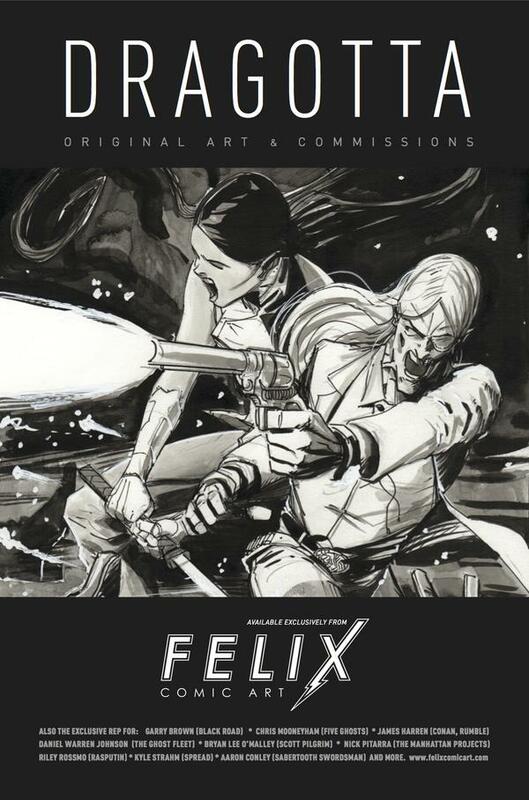 Those ads already ran in Image titles and highlighted the work of Pitarra, Chris Mooneyham (Five Ghosts), Nick Dragotta (East of West) and other Felix Comic Art artists. While it’s uncertain what the results are, that type of marketing isn’t just rare in the original art world, but in comics as well. Those efforts have driven major results for the artists he represents, with Pitarra earning ten times more with Lu than he did when he worked with two previous reps. Lu shared that Bryan Lee O’Malley of Scott Pilgrim fame saw his original art revenues jump up by an even higher amount. It’s working for them. So what does an artist have to give up for all of this? Shalvey shared that Belfiore takes 20% of his overall revenues from original art sales, and for him it’s worth it. It’s up to the artist to decide what’s worth it to have someone represent them in such a way, but at least for those artists I spoke to, it’s a fair deal. 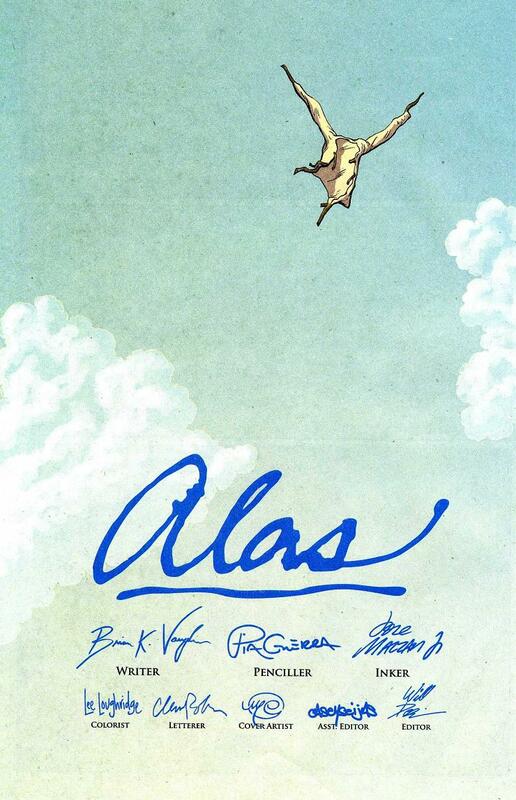 For Guillory, he had considered going that direction when reps had reached out – “It sounded really nice to just ship out the art and be totally hands-off with it, and just wait for checks to come in” – but ultimately, he wanted to put himself first rather than the rep names. Guillory’s able to take all the earnings for his family, and that’s huge when you’re dealing with the numbers someone of his stature is. But he’s also very fastidious for an artist, and that combined with a fantastic partner in his wife has allowed him to find success with selling his art himself. In recent years, the original art world has expanded to a significant degree. While one of the main reasons for that is the Internet’s value to sales, arguably the biggest part is the increasing diversity comics themselves are seeing, as Lu shared. Like comics, original art sales were dominated by the same group we’ve always seen in comics: white men. Now? Lu shares that for O’Malley, he’s seen almost half of his orders come from international buyers with a strong percentage of them being women. In the words of Lu that’s fantastic. Schachter has seen similar diversity, and even in economic levels that are buying from Essential Sequential. A big part of their growth also comes from the expanding creator-owned market, as in the past, characters and titles from Marvel and DC were the biggest drivers of original art sales. These days? Art from books at Image and Oni and many others can sell for as much if not more than what the reps I spoke to are seeing for your average X-Men page. That’s not universal of course. But even the shift we’ve seen has been a sea change for that aspect of the industry. That growth and diversity has given each rep I spoke to the ability to make a full-time living from their art sales businesses. That’s impressive. It’s easy to see why it works for them though. For every Rob Guillory out there, there are twenty artists who don’t have the time, comfort or wherewithal to handle selling their art themselves and for the right amount. That contributes to some of the negative financial and life experiences that artists I’ve spoken to have had in the past. If you’re one of those artists who struggles with managing commissions lists or getting original art out on time, it might be worthwhile looking into working with a rep. If you do, you should vet any rep or dealer before signing on and make sure what you’re getting into is on the level. That’s the absolute bare minimum, and the artist community is one that talks. Ask around first to ensure you’re partnering up with the right person. But at least in the examples of Murphy, Shalvey and Pitarra, artists lives have been made easier and more financially stable by that experience. In an era where artists struggle to make ends meet or have any free time, art reps can be an invaluable resource to artists in making a better living and a better life. That’s at least worth considering. Art in the piece, from top to bottom, is by Sean Murphy and DC Comics (in the header), Nick Pitarra, Sean Murphy, Declan Shalvey, Nick Dragotta and Rob Guillory, and taken from the websites of Felix Comic Art, Essential Sequential, Cadence Comic Art, Felix again, and Rob Guillory’s store respectively.